An ambitious project to acquire demographic census data at the finest possible spatial scale, and transform it to fit into electoral geographies. This project is ongoing, with the goal of strategically maximizing the impact of the Dogwood Initiatives’ environmental advocacy outreach programs. Dogwood Initiative are masters of outreach (witness the No Tankers loonie campaign), but like every advocacy organization they want to maximize the impact of their finite communications resources. They would like to be able to target specific communities — young students, new arrivals from Alberta, home owners — with different messages and methods. A good start would be to know where those communities are with respect to the electoral ridings that elect representatives to Parliament. Even better would be information at the more spatially precise polling division level. And if they had demographic data at that spatial level, they could tie it into extensive research they have done on voting trends and swing ridings. The outcome would be the greatest possible effect on political outcomes — maybe even changing the narrative at the federal level. Luckily, there is rich demographic data to be had from Statistics Canada’s census database. Unluckily, the census doesn’t divide the world up into the same spatial units as Elections Canada does. 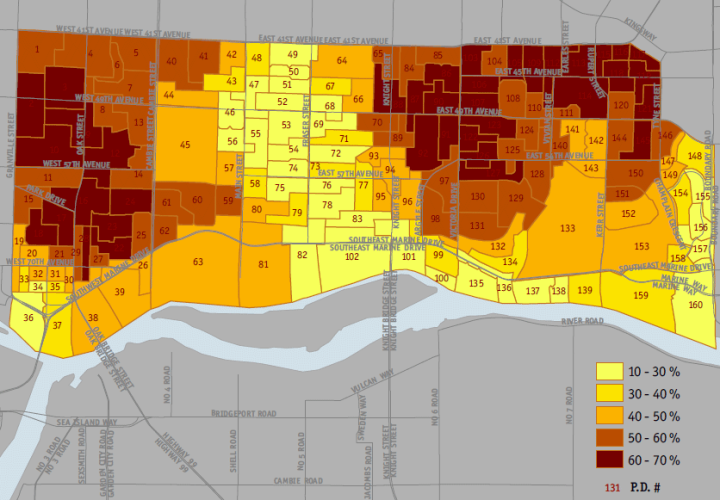 With the advice of Angus McAllister of Mcallister Opinion Research, I set out to gather as much demographic data as I could, at as fine a spatial scale as the Statcan census database allows. I am now in the process of spatially dis-aggregating the data from the Census geographies, and re-aggregating it according to overlap and intersection with polling divisions. The result is an emerging polling-division-level map of multidimensional trends and concentrations of communities, which Dogwood can use for maximally strategic outreach.